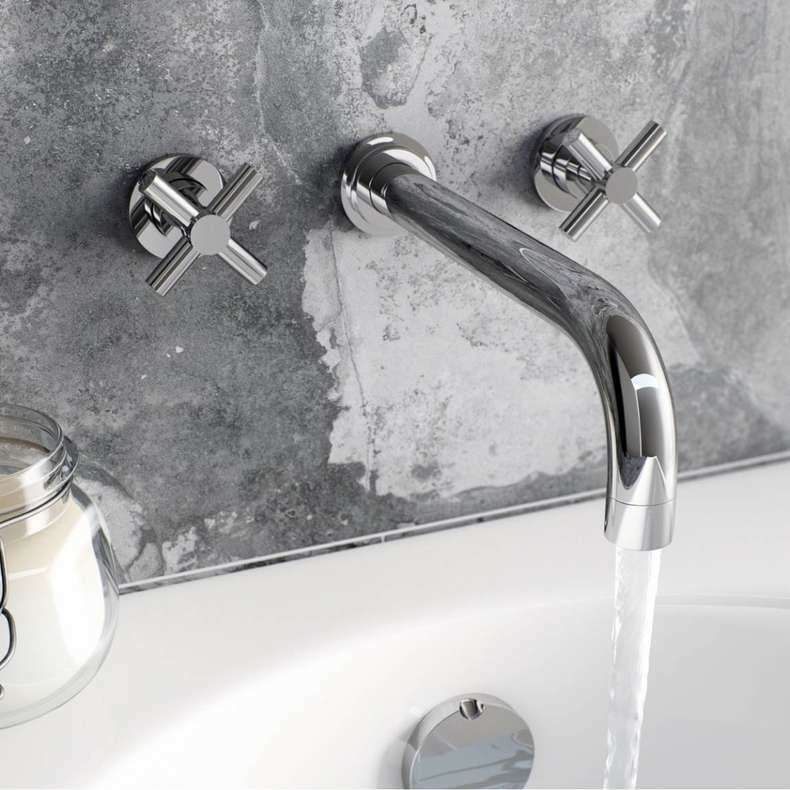 Wall mounted taps add style and luxury to a bathroom, and can suit contemporary or traditional looks. They require a bit more work and planning than regular taps, but the rewards are obvious in how fantastic they look. If you’re considering wall mounted taps for your bathroom, this guide will tell what you need to consider and give you an overview of the range available at VictoriaPlum.com. Wall mounted taps can be used with acrylic straight baths, freestanding or roll top baths. Many freestanding or roll top baths don’t have space for tap holes so work especially great with a freestanding tap, or a wall mounted tap. The Alexa wall mounted bath mixer tap combines a classic and contemporary look to create a tap that’s equally at home in a sleek, minimalist bathroom or a more traditional bathroom. The Secta wall mounted bath mixer tap embodies simple and contemporary style with easy-to-use lever handles to control the temperature and flow. If you prefer a more compact, minimalist design, the Erith wall mounted bath mixer tap, with its simple lever control, is the perfect solution. 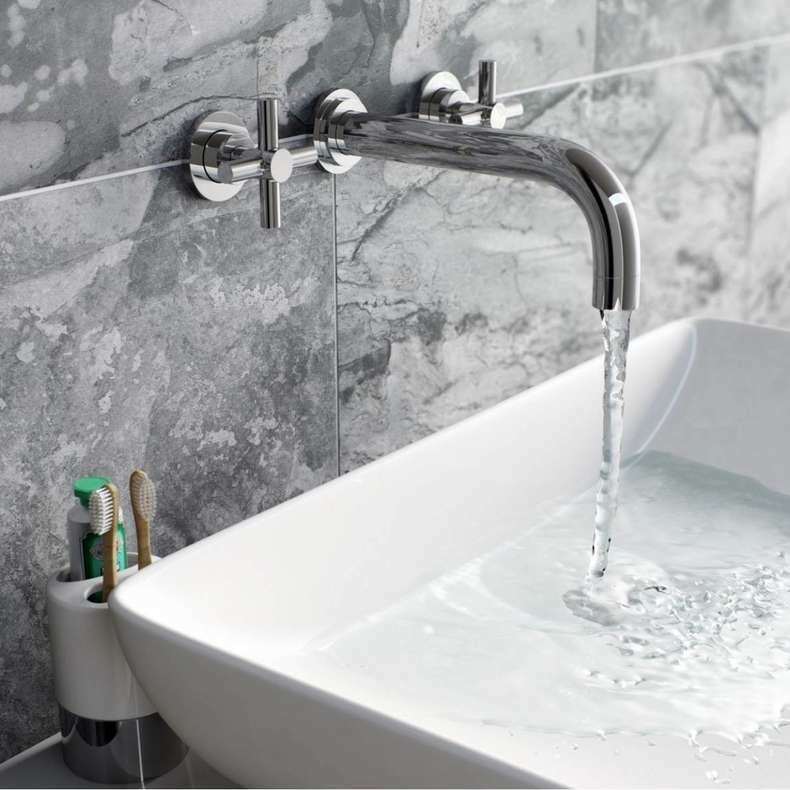 The Erskine wall mounted bath mixer tap is a stunning waterfall spout that projects straight out of the wall, and is controlled with a simple lever design, creating a beautifully minimalist and contemporary look. Wall mounted basin taps can also add a real style feature, and look fantastic with contemporary counter top basins, as well as more classic style bathroom fittings. You can match your wall mounted basin taps with wall mounted bath taps for a complete and unified look. The Alexa Wall Mounted Basin Mixer Tap matches the bath tap version, creating a blend of classic style and contemporary functionality. The Secta wall mounted basin mixer tap features lever handles, creating a more streamlined look that’s great a minimalist contemporary bathroom. With a wide range of taps available, in different styles, for your bath, basin and kitchen sink, our handy buying guide will help you find your ideal product, and give you an overview of what you need to think about when choosing your taps. Which bathroom tap should you choose? Whether you're designing a new bathroom from scratch, replacing worn taps or simply looking to spruce up your bathroom with a new look, it usually pays to think carefully about which types of tap are best for your own tastes and requirements. A bath can be a practical addition to a family bathroom, or a stunning and luxurious centrepiece, and your choice of bath taps can make all the difference. This guide will help you find the right choice for your bath.